West Cheshire College’s Young Enterprise team won the Ellesmere Port and Neston Young Enterprise Programme Award for Local Excellence at the Cheshire West and Cheshire Young Enterprise Area Final. 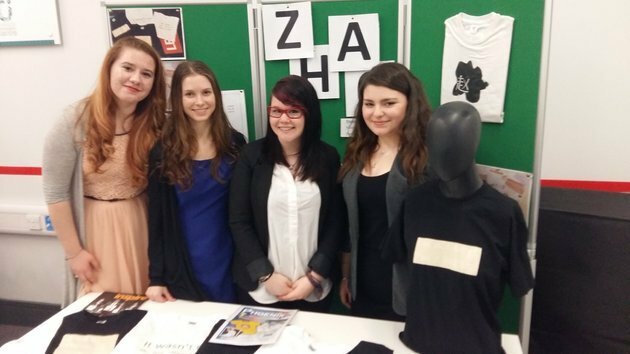 The team, consisting of five Level 2 Business students, took the top spot after setting up trading company ‘Zhao’ which sold bespoke t-shirts to the public. The students managed and delivered the whole process from developing different design concepts to researching materials and agreeing the selling price. Team member Stevie-Lea Court, 17, from Ellesmere Port, who took the role as Managing Director said: “The competition really made us all work as a team and enhanced everyone’s strengths. It was a great sense of achievement when we won the award as we were alongside a lot of other entries. “We conducted a lot of in-depth market research for the project and found a gap in the market for custom made t-shirts which the consumer can fully design themselves. “At the end of the competition we had a stall which displayed our visual graphics and we had to present our idea to the panel of judges. Team members were Stevie-Lea, Anastaija Karnova, Thomas Moscrop, Dominika Surcharczuk and Yasmin Yesidal.